Katie from Craptastic shared this awesome DIY patio table with an interchangeable centerpiece! I'm kind of swooning over the yellow chairs too! Love this card catalog coffee table from Crafty in Canada! ... and after a whole lot of magic (hard work!) from Helen at Picked & Painted! I think I would have had trouble parting with this beautiful gray dresser with milk glass knobs from Angela at Number Fifty-Three! I just love the curve of that top drawer! ... to this! Seriously amazing! This trunk table was created as a Father's Day gift for a husband who loves trunks - lucky guy! You can check out all the details over at Transformations by Jacqueline. Patti from Old Things New took a thrift store tiered wire basket and filled it with succulents - so pretty! 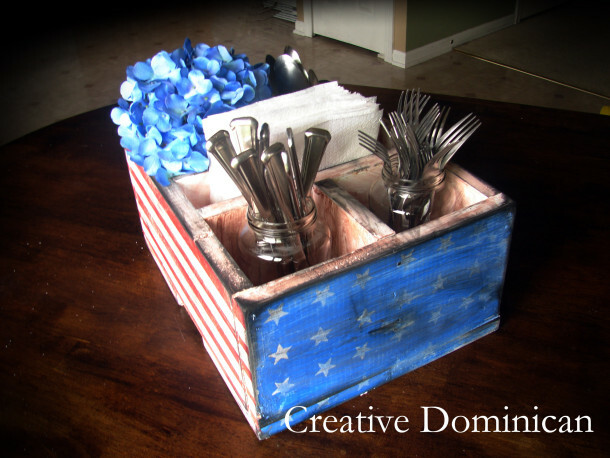 How cute is the patriotic silverware and napkin caddy from Rebecca at Creative Dominican! Perfect for picnics and parties all summer long! These blueberry mojito popsicles from Twigg Studios are so pretty! And don't they look so refreshing and delicious! And don't forget to check out all the inspiration at our June Garden Party! We'll be back later this week with features and the July edition of our party! I am totally blown away by the talent here today! Wow! Oohh! 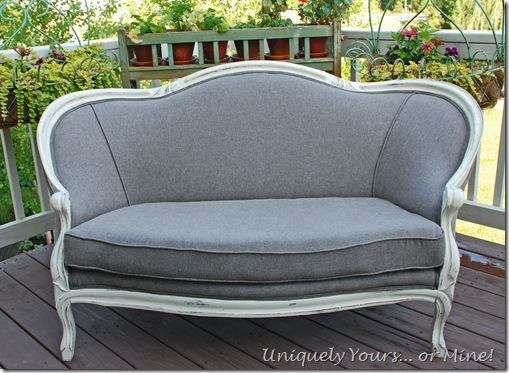 Thanks for sharing my settee makeover! I hope it helps someone! Sharon, what lovely features, that settee is amazing! Thanks for hosting and have a great week! Thank you Sharon for another amazing party . . . and the great surprise of seeing my tiered succulent featured! I sure do love the settee makeover. Susan is so talented. Hi Sharon!! Thank you so much for hosting! 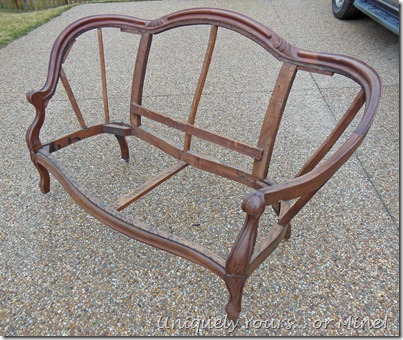 Love the features- and I love that you appreciate what goes in to some of these furniture transformations! :) I missed last week's party because we were on vacation, but I wanted to say thank you SO MUCH for featuring our laundry room makeover!! Love the succulents in the tiered basket. People are so clever! The settee is amazing. I need to check out that tutorial! Have a great week Sharon! Oh man, that settee has me drooling. So pretty! great features! Super party Sharon...wonderful features! Wishing you a fabulous week!! i LOVE that piece from susan! love it! i want a settee like that! Thanks so much for hosting Sharon! 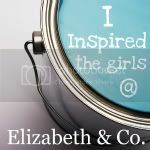 I don't think a lazy day is too inspirational, but I linked it up anyway! :) Thanks for hosting, Sharon! Wow....major transformations this week! And I love that tiered 'garden' :) Thanks for hosting! Thanks for hosting. Great features and wow, some people are so talented. Thank you so much for the feature Sharon!! Thanks for hosting too! Have an awesome week! Hi Sharon, you sure picked out some amazing transformations to feature. Love that card catalogue table. Thanks for the party! 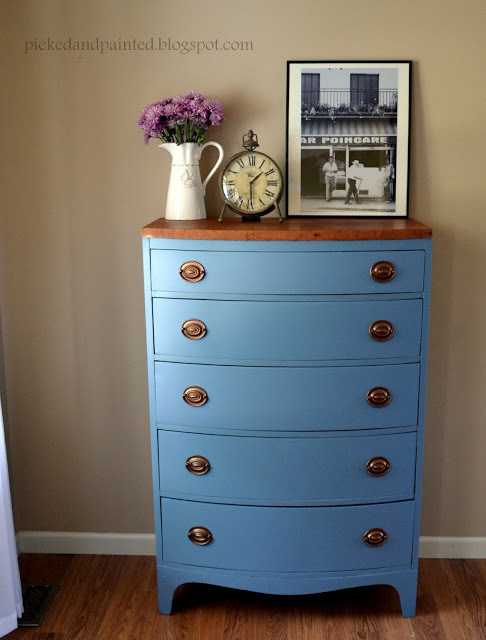 Sharon, thanks for featuring my blue dresser! You had amazing features....that sofa was gorgeous.